"New models, new finishes, improved specifications and the New Gibson Star Dealer System to give you the best Gibson service ever. Your Gibson Star Dealer offers the greatest selection of new Gibson instruments, including the latest 2 models (the L6-S and the Ripper Bass) plus a full after sales service. He’s there with all the facts on the complete Gibson range. Watch the weekly music papers for details of the Star Dealer in your area. 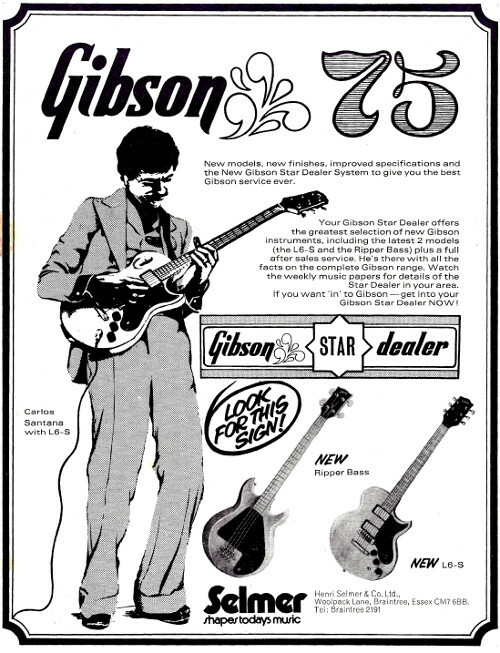 If you want ‘in’ to Gibson — get into your Gibson Star Dealer NOW!"